This weekend I was walking in New York City and a graffiti covered street corner caught my eye. I noticed a faintly familiar image of my favorite brand of ginger ale. I had no doubt that this was a piece of advertising. However, as the brand is nowhere as prominent as Seagram’s or Coca Cola, at least a handful of passerby will perceive this as art or even an act of defiance. The melding of consumer culture with art is not a new phenomenon. However, up until recently, it has served primarily as satire. 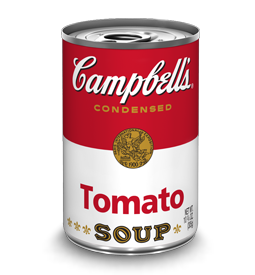 Warhol’s reproduction of Campbell’s soup cans tested the constraints of low and high culture by mass-producing art in the very fashion we mass produce material goods. 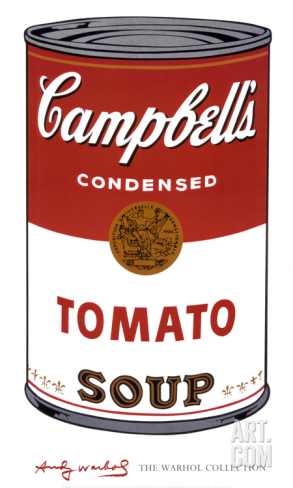 His iconic Campbell’s soup cans leave viewers unsure of how to discern art from the mundane, manufactured reproductions of the commercial realm. Whether known or unbeknownst to Fairey, his earnest message would soon become the very corporate marketing agenda it was meant to critique. 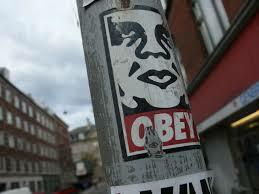 The anti-establishment origins of the OBEY graphic is now an iconic brand name sold on everything from hats and tee’s to magnets and mugs. Current culture more than ever has muddled the lines of art and advertising through a proliferation of mimetic imagery. The freedom and creative expression of art (especially guerilla) traditionally served to subvert the status quo and inspire questioning. Warhol and Fairey attempted to implant messages in their spoofs of advertising. Yet, art’s imitation of advertisement risks paradoxically perpetuating the system it wishes to disengage from. It seems modern advertising’s imitation of art is cashing in on this fallacy. Let Me Know, Comment Below: What are your thoughts on art imitating advertising and advertising imitating art? Is distinguishing the two necessary or even possible? I’ve indulged in mindless YouTube perusal from time to time at my desk job. Amidst more informative TEDtalks or lectures, I occasionally find myself listening to the rant of a complete stranger or watching a DIY video for how to tie shoelaces. Shameless, I know. More often than not, I will find myself incepted in a commericial within a commercial. In particular, “beauty guru” channels, seem to be the most guilty of this trend. Beauty gurus on YouTube predominantly vlog about what they are wearing, review products and conduct “hauls” which are essentially a tedious review of monthly or weekly purchases. Unboxing, for the layperson, is a term which means a product will allegedly for the first time be taken out of it’s packaging, on camera, and scrutinized in real time. Sound like a savvy consumer’s delight? Though the target audience may in fact be tweens, as a discerning adult viewer my question is: Why should we listen to you? Many of these “guru’s” actually land spokesperson deals and I’ve seen a number of them appear in actual commercials on YouTube. Apart from their already heavily sponsored How To videos. It’s great that health and beauty tutorials are available to young girls but the take-away messages of most, if not all, of these videos seems to be: “buy this”. Scroll down and you find an About section which merely rattles off hyperlinks of where to purchase mentioned products. 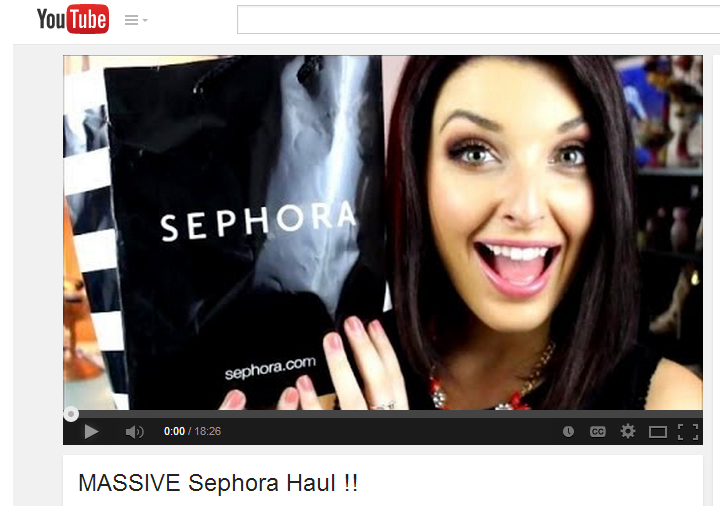 Sadly, beauty in a bottle isn’t the only misguided ideal infiltrated by YouTube beauty gurus. 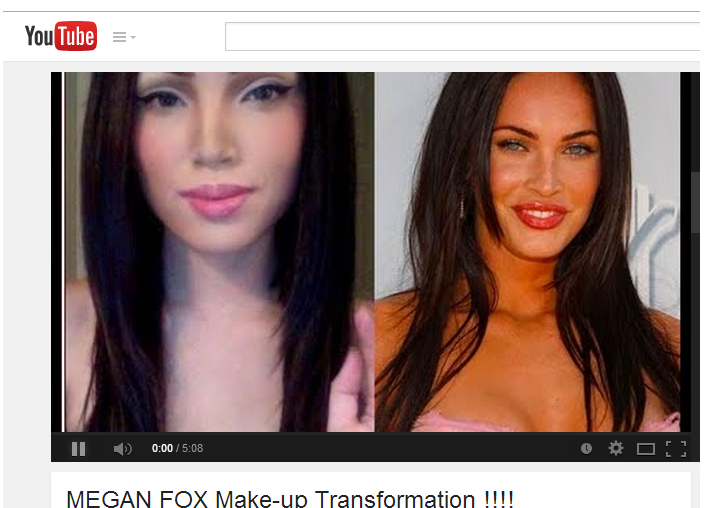 Another pervasive trend is videos tagged “Get the look __insert celebrity name__”. These videos hone in on one teen adored icon and provide a detailed, step-by-step instructional for how to apply make-up and put together an identical rendition of their outfit. Not only do these videos condone superfluous consumerism, they demonstrate to young girls that being yourself isn’t good enough.